This recipe comes from my mother, via the "Sunset Cook Book of Breads" (1984). Mix yeast with warm water & set aside for about 5 minutes. Mix together yeast mixture, milk, butter, eggs, salt, sugar, and anise thoroughly before adding flour. Gradually add flour one cup at a time mixing/massaging the flour in evenly. When the dough has doubled in size (1-2 hours) punch it down & divide it up into 2 even halves. 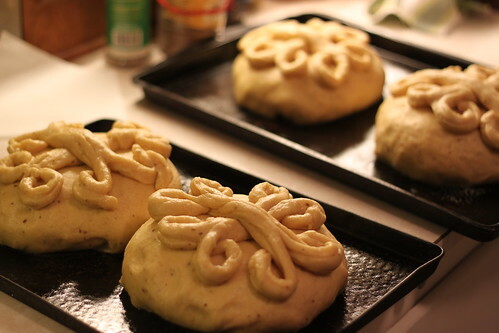 Additionally cut off about 1 Cup worth of dough from each, and set aside (will be used later to decorate). 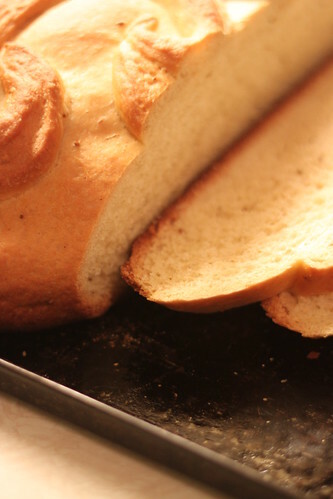 Kneed each half into a smooth round, and place on a flat baking sheet. Shape the 1 Cup of dough into two equal-length ropes, cutting down each end of the ropes to create the traditional Greek cross shape. Finally, garnish the holes with walnuts or candied cherries, and wipe the top with an egg-white to add shine. You can make this same recipe into a single large loaf, but it is a bit unwieldy, and relatively hard to find a non-pizza pan for.